If you are only going to trek to Machu Picchu once in your life, do it in style with this high quality 9-day itinerary including time to acclimatize and enjoy Cusco. 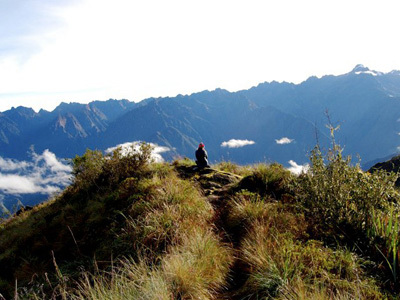 Our Inca Trail programs can add one day onto the Trail. On this itinerary, we start the Trail a half day after the largest tourist groups. In this way, our camp sites are always half a day behind the big groups, ensuring quieter, more private nights, and a less crowded Trail during the day. Similarly, we arrive in Machu Picchu after the morning crowds have left the site, allowing for a more relaxed introduction to this legendary place. Rates vary depending on hotel choice and group size, we offer 3 star, 4 star and 5 star hotel options. 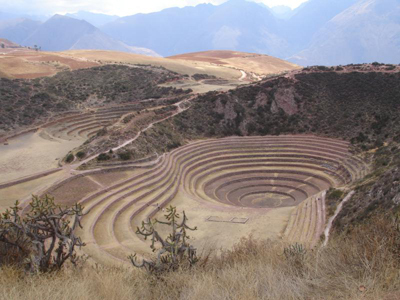 Today, you will be taken on a half day private guided tour of the city, including some of the nearby Inca ruin sites. 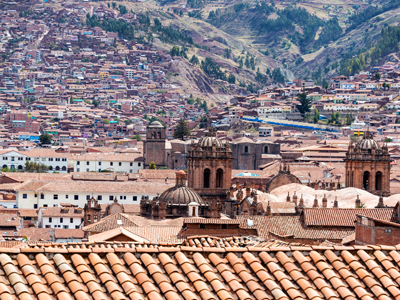 Cusco is a city with a wealth of history and splendor. As you wander through the streets, you will be guided through centuries of traditional culture and unique architecture. There is something to be admired in every direction you look, and a story to be told at every street corner. 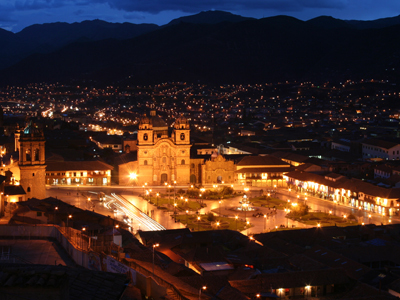 During your exploration, you will have the opportunity to discover the many highlights and hidden gems of Cusco. Although the modern travelers and vibrant night life can now be recognized in the city, Cusco is still known for its indigenous population--often seen on the streets in traditional clothing, maintaining it's colonial charm. 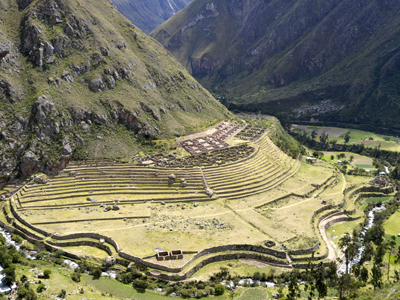 This morning, you will be picked up from your hotel in Cusco, to embark on the fascinating Inca Trail Trek! A spectacular drive through the Andean highlands will take you to Chillca, the trailhead (2,670 m / 8,760 ft), where your adventure on foot begins. Crossing a footbridge, you will be led on an undulating trek through a dry cactus zone, beneath soaring views of Mt. Verónica, with the turbulent Urubamba River on your right. You can stop for a break on a bluff, high above the Cusichaca Valley, to let your breath be taken away by the imposing sculpted terraces of Llaqtapata, a massive Inca farming complex. Afterwards, you will turn south and follow this side valley upstream to the village of Huayllabamba, where you will set up camp for the evening (3,000 m / 9,842 ft). From Huayllabamba today, you will begin a steeper ascent, climbing the Llullucha valley, along a stream that rushes through enchanted native unca woodland. Crossing the rim of a small plateau, you will abruptly find yourself in the puna, the treeless grasslands of the high Andes. Here, a stretch of open trail climbs beneath mighty crags, to your first and highest pass, Warmiwañusca (4,200m/13,776ft). From Warmiwañusca, you can look back to the spectacular snow peaks and valleys of the Huayanay massif, and ahead, to a distant view of tomorrow’s trail to the second pass. Descending a stepped stone trail, you will encounter your campsite (3,627m / 11,899 ft) in a clearing of the forested Pacamayo valley. Picking up camp this morning, you will head along an Inca stairway and ascend again past the small Inca site of Runkuracay . 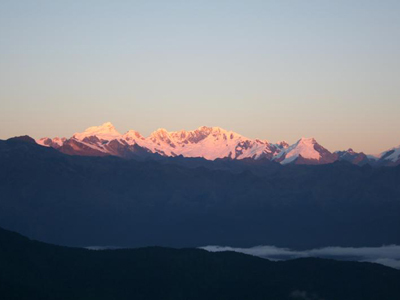 As you reach the second pass (3,900 m /12,800 ft), the landscape opens onto spectacular new views of the snow peaks of the Pumasillo range. You will descend again to the ruins of Sayacmarca (Inaccessible Town), an intricate labyrinth of houses, plazas and water channels, perched precariously on a rocky spur overlooking the Aobamba valley. The Inca trail, now a massive buttressed structure of granite paving stones, continues along the steep upper fringes of the cloud forest, through a colorful riot of orchids, bromeliads, mosses and ferns. 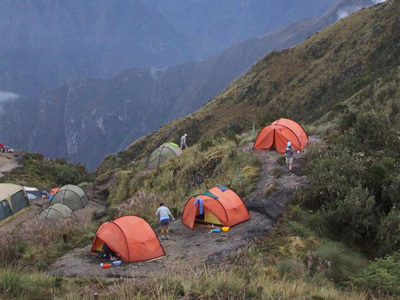 At the third pass, you will camp by pinnacles topped with Inca viewing platforms, overlooking the archaeological complex of Phuyupatamarca (Cloud-level Town) (3,600 m / 11,810 ft). Today, you will explore the wondrous maze of Inca stone towers, fountains and stairways, spilling down the mountainside at Phuyupatamarca. You will then proceed to begin a long descent through ever-changing layers of cloud forest. An Inca stairway, partly cut from living granite, leads you at last to the site of Wiñay Wayna (Forever Young) (2,650 m / 8695 ft), the largest and most exquisite of the Inca Trail sites. In the afternoon, you will follow the last stretch of trail across a steep mountainside and through a lush, humid cloud-forest of giant ferns and broad-leaf vegetation. Suddenly, you will cross the stone threshold of Intipunku (Sun Gate) and encounter an unforgettable sweep of natural beauty and human artistry –a backdrop of twisting gorges and forested peaks framing the magical city of Machu Picchu (2,430 m / 7,972 ft). Every step of your excursion will be worth it, once you are rewarded with this! Following your first visit to the ruins, you will continue to Machu Picchu Pueblo, where a comfortable night's rest in a hotel awaits. Enjoy an early morning visit to the fabled ruins, spending today in both guided and individual exploration. Take your time to investigate the multitude of hidden nooks and corners, as you discover the most fascinating features of this astounding and mysterious Inca settlement. If you're itching for a challenge, you may be interested in embarking on the grueling trek up to the summit of Huayna Picchu. Facing steep and exposed steps, this journey is not for the fainthearted, but offers an astounding "condor's eye" view above the ruins. 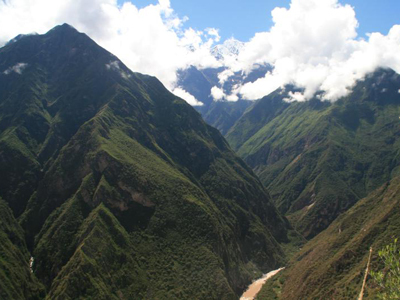 Please note that this trek requires a special Huayna Picchu Permit, which has not yet been included in your tour. Should you be interested in taking on this expedition at an additional cost, please let us know as soon as possible, as permits do sell out. After an overwhelming adventure of this glorious monument to the Inca achievement, you will ride the return shuttle down to Machu Picchu Pueblo, where you will board the Vistadome train back to Cusco. 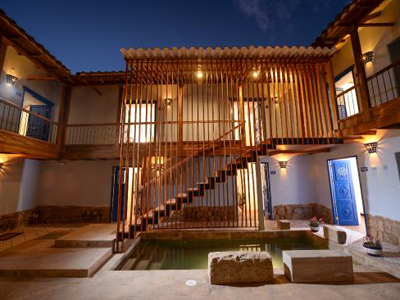 Upon arrival at the Poroy station, which is located just outside of Cusco, you will be greeted by your driver and transferred to your accommodations within the city. Fall asleep dreaming of today's once in a lifetime experience! This is just one of many authentic travel experiences offered by Global Basecamps. If you are interested in more unique destinations to Peru with unprecedented planning and extraordinary service visit our main Machu Picchu hiking tours page to browse other sample trips.